An exciting and unique work, this comely hooked rug consists of an eccentric arrangement of motley colored squares and rectangles. Beautiful Antique American Hooked Rug, Origin: United States of America, Circa: First to Second Quarter of the Twentieth Century – Here is a unique and beautiful antique carpet – an antique hooked rug that was woven in the United States of America during the first half of the twentieth century – roughly, during the 1930’s. An exciting and unique work, this comely hooked rug consists of an eccentric arrangement of motley colored squares and rectangles. This gives the carpet a superficial similarity to a patchwork quilt, but this is in fact a more sophisticated composition. 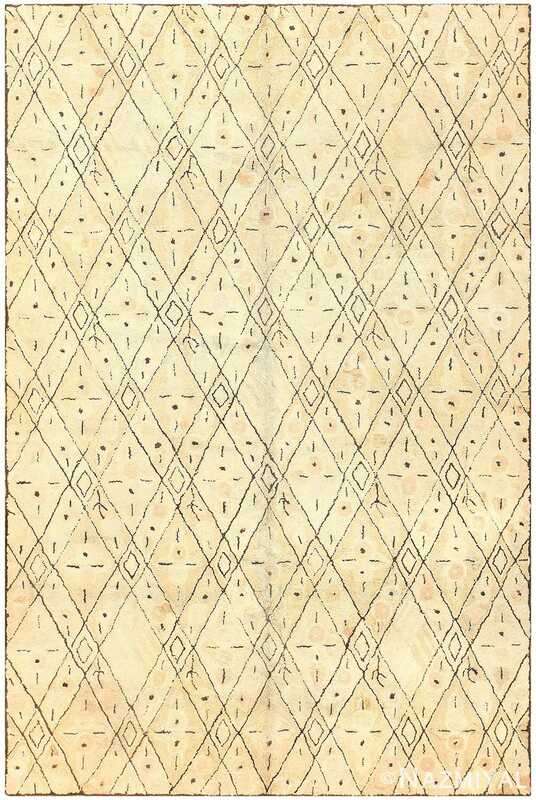 Because of the scattered and eccentric nature of the arrangement of the squares, this carpet suggests a great many different qualities, with its energy moving in many different directions at the same time. Most of these squares and rectangles are colored in shades of red, though grey, green, orange and other colors appear as well. Some squares feature crosshatching, while others stand as unmolested blocks of color. The overall effect is one of great imagination. 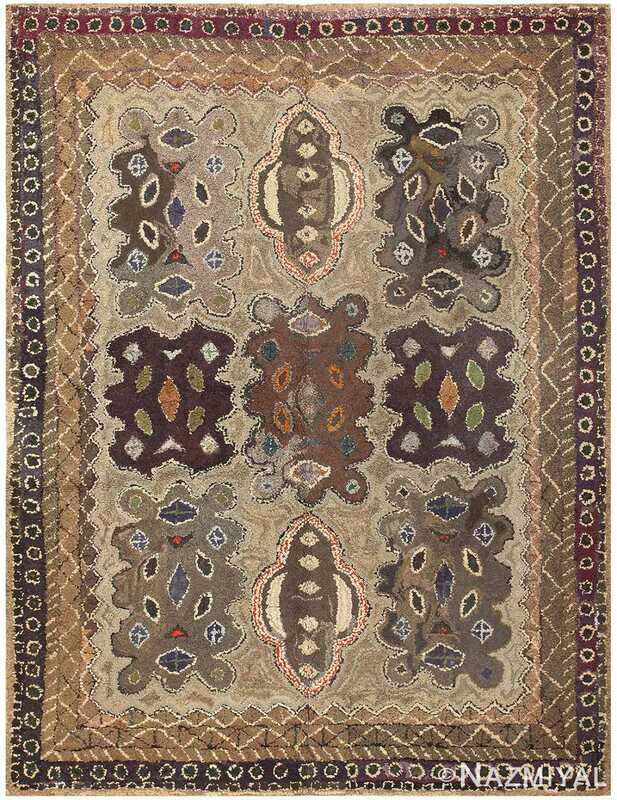 A unique and exciting work, this antique hooked rug from the United States is a compelling example. It features a brick-like pattern of multi-colored rectangles and squares in warm colors like rust, brown, orange, and pink, punctuated by squares in cool grey and green. 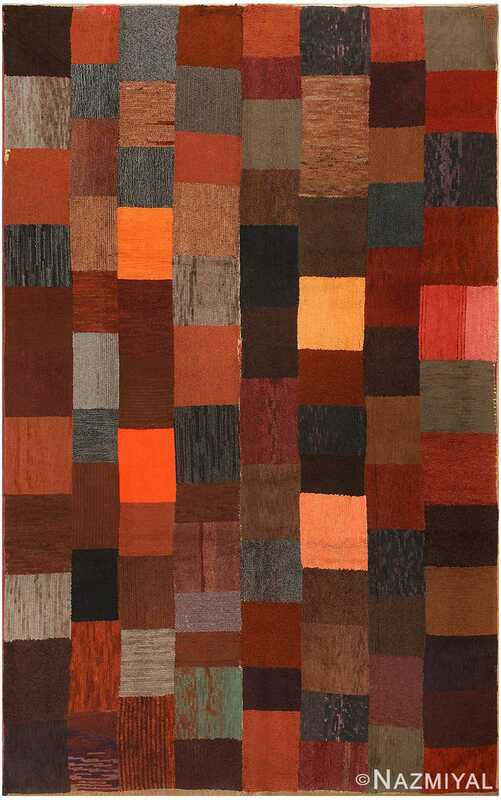 The hooked rug is the most distinctive and well-known of American antique rug types. Native to the north-east, the style has its origins in the mid-19th Century. During this time, making hooked rugs was a popular and an inexpensive way to make rugs from household scraps, and the rugs aided in keeping homes warm in the cold winters. The designs of these rugs vary greatly, from stripes, to pictorial scenes, to floral or geometric motifs, and many have patriotic themes. Unlike woven rugs, these rugs are made from pulling fibers through a canvas base, making these rugs flat on the bottom and giving them an uneven pile. These attributes make hooked rugs great for hanging as tapestries, in addition to using them on the floor. This charming antique American hooked rug is a wonderful example of American handcraft. It would lend a rustic touch of Americana to any interior! 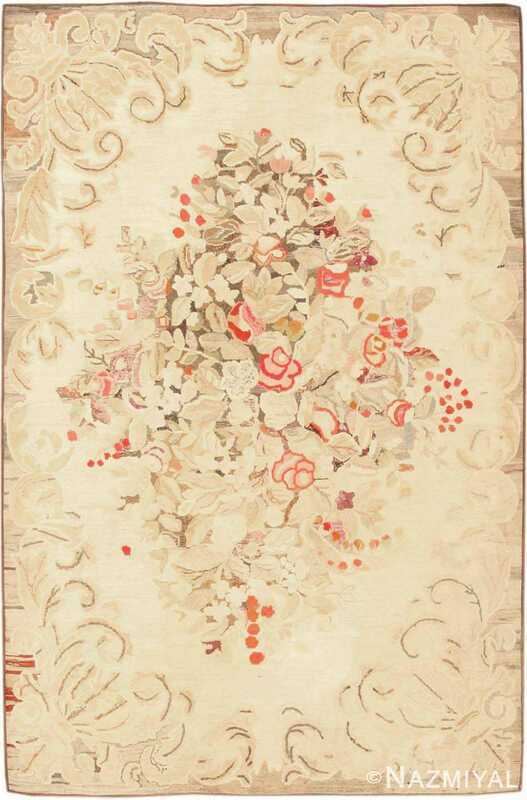 This outstanding antique hooked rug is an American response to the elegant design of French Aubusson tapestry and Savonnerie pile rugs.